Graphs at a glance: Wonga's phoney lawyer letters. 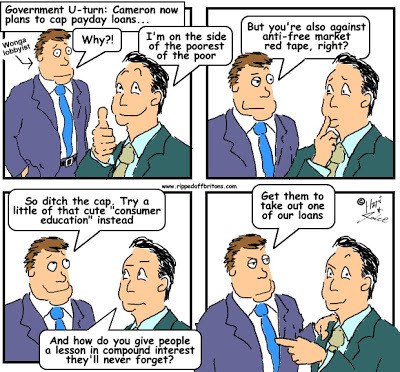 What's really shocking, the same tactic is used by high street banks, utility companies, and the government! Wonga sent phoney lawyer's letter to 45,000 customers between 2008 to 2010. Shocked? You shouldn't be. "High street banks are using Wonga-style bullying letters to chase customers for payments. Barclays, Lloyds, Halifax, RBS and HSBC are among firms who have sent customers letters that look like they are from outside firms when they are not. Energy giant Scottish Power and Anglian Water, which supplies families in the East of England, are also using the letters." "The Student Loans Company is facing calls to compensate more than 300,000 graduates sent [between 2005 and 2014] misleading "Wonga-style" debt collection letters." How seriously is this kind of deliberate intimidation by deception taken by the authorities in Britain? As a rule of thumb, the seriousness of a crime is reflected by the size of the penalty. Let's consider Wonga's penalty. As a result of its threatening bogus letters Wonga was required to cough up £2.6 million by the Financial Conduct Authority (FCA). The FCA claimed that it could not take the matter any further, i.e. larger fine or prosecution, as the investigation had started under its equally inept and now defunct predecessor the Office of Fair Trading (OFT). For some poorly explained reason the FCA judged that this let Wonga off the hook. Is £2.6 million by itself much of a penalty? Wonga point out with some justification that it isn't fair to use the 5,853% APR of a Wonga loan, because the APR is based on assumptions that don't apply to short term loans. So, instead of working out how long it would take a Wonga loan to grow to £2.6 million using 5,843% interest, let's take another approach. 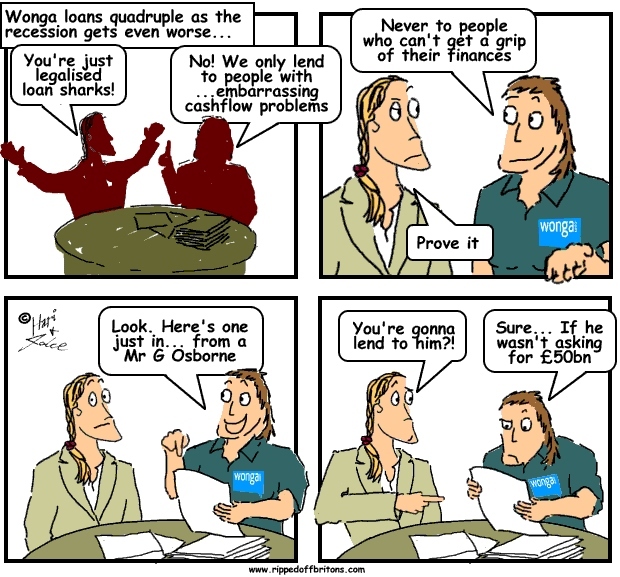 Question: How tough is it for Wonga to "generate" £2.6 million? How long would it take Wonga to generate £2.6 million by repeating "roll over" of this original £180 into new loans? Answer: In just under 3 years, Wonga can grow £180 into the £2.6million it needs to pay its penalty. "We are pleased that Wonga has been working with us to put matters right for its customers and to ensure that these historical practices are truly a thing of the past." "Truly a thing of the past"? Does that include the banks, energy and water companies? And government agencies too? We shall see. Insurance companies and local councils also using this tactic. Car Parking companies are worse . They send out letters designed in a way that looks like it is an official letter from the Police which in itself is an offence.These are letters claiming payments for fines which are unenforceable.